Really free Wifi at T.E.A.libraries? 'Get free WiFi by just opening your portable computer, such as a note book and you will have it! No need to download some WiFi reception software first'. I was told all this at the TEA library information desk. See a photo with the friendly lady TEA library officer depicted above. The lady helped me to understand why there is no problem with WiFi without paying at TEA. 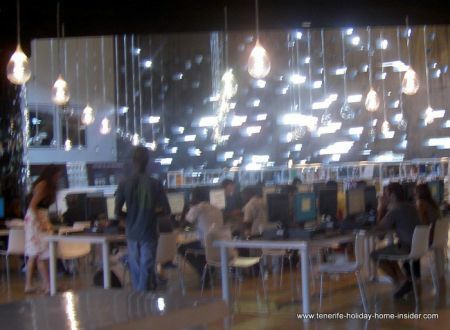 The Tenerife libraries of the art center downtown in Santa Cruz are ideal for studies by Internet in peaceful and uncomplicated surroundings More about them by scrolling down. Of course, even the elderly foreigner with a holiday home in Tenerife will be welcome there. Free Wifi is for everybody who shows up in the capital capital of Santa Cruz de Tenerife. Below discover many TEA students who study online using Wifi with normal computers as well! Click to enlarge the photo above of the desk computers at the library of the art museum. Needless to say is that most young people arrive at the libraries of TEA with their own note book computers. to hook up WiFi. Thanks to their own portable computer they may select the library nook which they like best. All TEA library sections are suited for Internet learning with WiFi without charge. Online libraries access from TEA study center. Just figure, art research material which the TEA libraries don't have offline may be found by online libraries via TEA WiFi without pay. Just now go back from WiFi to Tenerife libraries with more pictures. They portray why a culture of learning seems to be so natural in this innovative center TEA for online study of the Tenerife capital. More free Wifi in Tenerife? They say that all new Tenerife electric trams have free WiFi connection inside. There are also rumors of Beach Playa La Arena by Los Gigantes being blessed with it. So is Playa de el Socorro of Los Realejos. Of course, all Tenerife libraries provide Wifi free of charge. 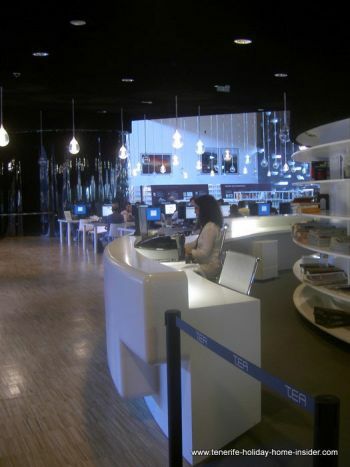 The new library in Calle Vieja Puerto de la Cruz that opened in summer 2014 also has that service. The museum library of TEA Santa Cruz which is also a center for contemporary art exhibitions is a free of charge wifi hotspot indeed. By the way, I am sure, it serves free of charge regular broadband as well, when people use its normal PCs. Once, I was offered WiFi without cost. There is a WiFi antenna on top of my apartment. I wasn't interested at the time, as this Wifi was not fast enough for my liking. And now, the provider has disappeared and I located a far better one, a fast one. By the way, it has been possible to buy a cheap provisional Internet connection in shops of Vodaphone, Moviestar and other cellular phone providers in Tenerife since 2012 or even earlier. The applications can be used for iphones, laptops, notebooks and tablets. Bar Metropolis Arona Playa de las Americas for high speed Wifi? They say that you even catch a high speed connection when you are on the nearby beach. Not all restaurants, cafés and bars in Tenerife give you free wireless Internet. Just look out in any restaurants, bars, cafés, cafeterias etc for a sign which says:'Free Wifi'. Even spot it in shopping malls, shopping centers and on beaches. Playa la Arena as well as Playa del Socorro belong to seashores with free Internet. From free Wifi back to free Internet service in Tenerife hotels or by other hotspots, worldwide Internet libraries, Tenerife libraries, travel clubs and more.